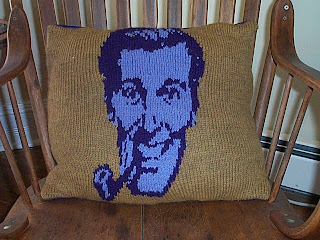 Well here is my pillow with "Bob Dobbs" on it. He is a registered trademark for the Church of Subgenius--and stands for all those rebels and freethinkers out there!!! He is the odd pillow out in my collection of my knitted pillows, just as his name implies he doesn't fit in with my Southwest art crafted room and I love it!!! He represents me in Lexington!